So how exactly does a bunch of very rich 50-something men, long since drifted away from their origins, and – quite likely – what inspired them in the first place, forge something that is both relevant to them and their audience? The answer is a complex one, and while the back-to-basics atmospheres contained in Songs Of Innocence shed some light on possible resolutions, you can safely bet that whatever answers are given will be filtered. Coming five years after No Line On The Horizon – a weak album that sold over 5 million copies - Songs Of Innocence should have been poised to undermine the band’s previous record by being on-point, unquestionably brilliant, and a surefire affirmation of the next, much more mature chapter in U2’s history. 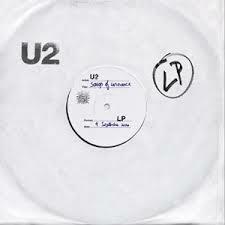 Instead, it is like so many of U2’s back catalogue: out of eleven tracks there are four, possibly five, gems. The rest aren’t so much filler as chunky pieces of coal. More of this later. What does back to basics actually mean? Bono has described this album as being about his Dublin – “about being teenagers on the northside and how our city shaped us both as men and musicians” – and that’s fair enough. Looking back to a point in time when character develops, personal philosophies simmer, and thoughts consolidate is grist to the mill for a good songwriter, but there remains in Bono (despite, let’s be fair, his best intentions) a fault-line of ambition rarely, if ever, exceeding those intentions. That said, there is a level of reflectiveness here that isn’t always on U2 records – songs of tribute (The Miracle Of Joey Ramone is self-explanatory, as is Iris, which is an intimate confessional about Bono’s mother; another track, This Is Where You Can Reach Me Now, pays due homage to The Clash’s Joe Strummer); songs of beauty (Every Breaking Wave, Sleep Like A Baby Tonight and The Troubles); and songs of recall (Raised By Wolves, Cedarwood Road). There is throughout the album, also, an emotional base from which honesty and certain truths fan out. From an artistic point of view that’s no bad thing. But, Jesus, some of the songs are woeful. The aforementioned Clash tribute is one of the worst songs U2 have written let alone released – a cod ska-punk homage that simply doesn’t ring true. Ditto Raised By Wolves, Iris and Volcano, each of which sound like all of the other tracks U2 stick on albums in an attempt to pump up the volume. Bowdlerized, bereft of merit, these songs just lay on the ground like an irritable baby in a full nappy. In contrast, the likes of Every Breaking Wave, California (There Is No End To Love), Sleep Like A Baby Tonight and The Troubles are, pure and simple, gorgeous tunes - the kind that make you wonder why on earth U2 don’t keep it simple but effective all of the time. Within the context of the band’s back catalogue, Songs Of Innocence is yet another curate’s egg of four-to-five great songs beaten over the head by a batch of mediocre ones. You get the themed background referencing, you get the hand-on-heart emotional reach, you get the surfeit of trusting in memories and the (general) lack of bombast, the reaching into the past to make sense of the present, and you like the fact that the album cover design (overseen by long-term U2 album cover designer, Steve Averill) is very 1977, self-referential, punk rock DIY aesthetic. What bewilders (yet again) is the quality control, and how it has been allowed to fluctuate so wildly. Leaving aside the band’s business alignment with Apple and Live Nation, and the fact that they are no longer managed by Paul McGuinness (that’s another bundle of business brunches altogether), is there no one that could have told them to drop at least three songs from this record? But then, maybe (and it’s only a theory) U2 and its management needed/wanted as big a commercial push as necessary to coincide with the album’s release, and maybe Apple’s launch of its new iPhone was deemed to be the best fit possible? Certainly, releasing the album, for free, on iTunes (until October 14, when the album will be available to buy in digital and physical formats) was as audacious and as big a commercial push as it gets these days. Overly magnanimous, too, come to think of it. But then that’s U2 for you. They might sing of being back on the streets of the northside of Dublin, but you can bet your bottom cent they ain’t ever going back there. Fair enough – they’ve grown out of their past (it happens), and throughout Songs of Innocence they aim to come to terms with it (that happens, too). A much better album would have been nice, though.